We’re fighting for decent wages and a voice in the workplace and our struggle is growing! We’re sick and tired of low pay, stolen wages, no set schedule, not enough hours, and no right to speak our minds at work without retaliation. More and more ordinary working people are rallying around our demand for a $15 an hour minimum wage and walking off the job to get their message heard. This nation-wide action on August 29 is set to be the biggest yet! The McBudget is a joke. Just get a second job, they say. We say, $15 an hour is what we need to survive! Let the so-called “experts” claim that this will hurt jobs and the economy. We know that McDonald’s, Starbucks, and Yum! Brands each made over $1 billion in profits last year and Walmart topped the chart at $17 billion. These massive corporations are driven by one thing and one thing alone, maximum profits. Public pressure won’t be enough to get them to bend. That’s why we have to make this a truly massive movement. 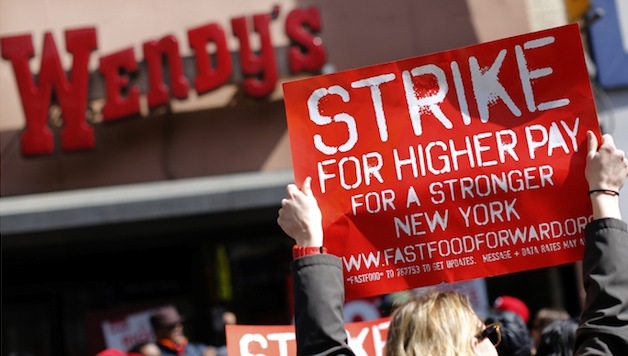 There are millions of us low-wage workers that are just as fed up. We need to mobilize this anger and build mass protests across the country by setting dates for rallies way in advance to allow for major outreach and publicity to build for the largest possible demonstrations. These one-day strike actions organized by various activist groups and the Service Employees International Union (SEIU) are an excellent start. Now we have to get even more organized and form groups in our workplaces to discuss and debate a plan of action. We have to build up the confidence of our fellow workers that we can take on the bosses. While we may not be ready yet, we need to be clear that to win will require building up enough organized support to carry out strikes that involve the majority of our co-workers in order to stop business as usual and make management listen. A lot of Democratic Party politicians have come to our rallies to show support. That’s all well and good, but where have they been and what have they done for the last 2 or 4 or more years? Is it just a coincidence that we are hearing from them now that we’re getting out on the streets? We have to watch out for the Democratic Party politicians who are financially backed by the same major corporations which make super-profits by exploiting our work and paying us low wages. They may say they are with us, they may say they support a living wage, but at the end of the day they need to choose a side. Are they with us for $15 an hour and a union or with McDonalds, Burger King and WalMart who fiercely oppose such measures? That’s why members of Socialist Alternative, are running for city council starting in Seattle, Boston and Minneapolis. The main demands are for a $15/hr minimum wage, affordable housing for all and taxing the rich to pay for education, transportation and other needed social services. Socialist Alternative has always supported low-wage workers struggles to form unions and fight for better pay. Socialists refuse to take any money from big corporations and only rely on the support of workers and activists because it’s all about building a voice for working people and building a movement. It’s time for working people to run our own candidates and start forming our own party that doesn’t take money from corporations or cut deals with the two corporate parties, Republican or Democratic. We also believe that the whole for-profit system of capitalism is corrupt. If this system can’t afford decent wages, rights in the workplace, housing, education and a decent quality of life, then we have to say that we cannot afford this system! We need democratic socialism where working people collectively own and democratically run the workplace, the companies, the economy, our communities and our society as a whole. August 28 marked the 50th anniversary of the historic March on Washington. That march was about more than just civil rights. It was called the March for Jobs and Freedom and it was organized by socialists. One of the demands was for a near doubling of the minimum wage to what today would amount to over $15 an hour. It is time to follow in the footsteps of the earlier generations and re-launch a new mass movement for jobs and freedom. But this time it has to be bigger, it has to be stronger, it has to be bolder and it has to take on the whole system.